Our aim is to create employment opportunities for neighbouring residents with the construction of the new children’s hospital and opening up new and existing jobs within the operation of the hospital and St. James’s via a strategy of targeted recruitment and training. We have developed an innovative Community Benefit Clause which is in included in each of the construction tenders (i.e. Enabling Works, Main, Mechanical and Electrical with a mechanism to involve the sub-contractor supply chain. This Clause specifies a required target for what we are calling “new entrants” i.e. people who have been 12 months unemployed, recently left school or college or are new to the construction industry. All vacancies must be notified to the Local Employment Service in Dublin 8 and 12 and the Department of Social Protection’s Intreo Office in Cork Street, Dublin 8. Mechanisms will also be put in place to notify local residents and others who may be interested in availing of jobs with the contractor along with an anticipated workforce requirements and timelines. We will be working closely with statutory agencies and community based organisations involved in education and training, particularly the City of Dublin Educational Training Board and local Colleges of Further Education to ensure that adequate programmes are in place to address skill-gaps and/or re-train people so as to increase their chances of securing employment. We will also be working closely with the Contractor to make sure that training matches current industry needs and as a workforce plan is developed for the children’s hospital we will be encouraging the initiation/and or expansion of health related courses to align to future skill demands. The inclusion of an innovative Community Benefit Clauses in all project-related construction contracts with employment targets for long term unemployed and new entrants is ensuring that local people are benefiting directly from employment opportunities. 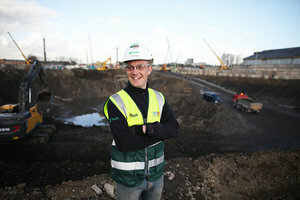 During the initial yearlong enabling works, where the community benefit clause was piloted 4 new entrants representing 10% of the construction workforce – have been employed in roles such as engineer’s assistants, site administrators and general operatives (for a total of 147 work weeks) and continue to work on the project. An additional 14 people from Dublin 8 and 12 were also employed for 300 work weeks. 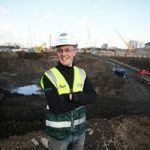 Ross Burns (21) from Inchicore has been working on the site of the new children’s hospital for the last 12 months as an Engineers Assistant, gaining invaluable experience across all areas of construction.